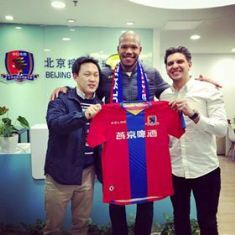 São Paulo born Nigerian striker Dominic Vinícius Eberechukwu Uzoukwu is off to a flying start at his new club Beijing Enterprises Group, whom he joined in the winter transfer market. On Saturday morning at the Beijing Olympic Sports Centre Stadium, the former Vejle BK star needed only 21 minutes to open his account for Beijing Enterprises Group against Zhejiang Yiteng, converting a spot-kick after he had been hauled down in the 18. Uzoukwu hit a left-footed shot low into the corner of the net to double his team's advantage. Beijing Enterprises Group's other two goals came courtesy of Liu Yi and Wen Chih-hao in the 3rd and 50th minutes respectively. Prior to Dominic's transfer to the Chinese League One club, he had found the net nine times for Vejle in 16 appearances in the Danish First Division, and tallied three assists in those games. The 23-year-old, who was once on the radar of Nigeria's U15 coaching staff, has pledged his international future to Nigeria ahead of his country of birth, Brazil. Thanks to their 3-0 rout of Zhejiang Yiteng, Beijing Enterprises Group top the table after the opening round of matches in the second-tier.